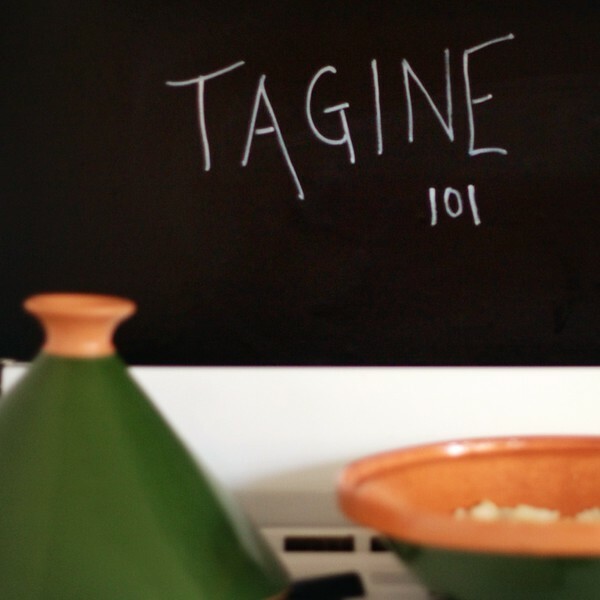 Tagine, or tajine, or طاجين, is both the name of a kind of cookware as well as the kind of dish made within it (on how long it’s been around in English and how it’s been transliterated, see here). You can also use it just for serving, of course. There are a few tricky issues when it comes to using tagines for cooking in the U.S., however, which I’ll address here in turn. 1. Where do I get one? A regular everyday market in Morocco is the best place to get a good tagine for a spectacular price, but of course everyone can’t just hop over to Morocco––and a tagine will take up a lot of space and weight in your luggage anyhow. Stateside, you can find tagines in high-end spots like Williams Sonoma and Sur la Table, but they are so outrageously expensive there that it’s a bit off-putting. My first stop when looking for one in the U.S. is Middle Eastern or North African groceries, which often have a selection of tea glasses and hookahs and perhaps some good tagines for sale. If you don’t have one nearby, I recommend the aptly named tagines.com. Good selection and decent prices (and nope, I don’t know who owns the site or get a commission for saying this). 2. Now I’ve got one; how do I keep it from cracking while cooking with it on a gas or electric stovetop? This is the trickiest part of cooking with a tagine. I have a gorgeous blue tagine my godmother bought in Marrakesh years ago and it cracked once at the end of a meal because I’d moved it off heat too quickly. 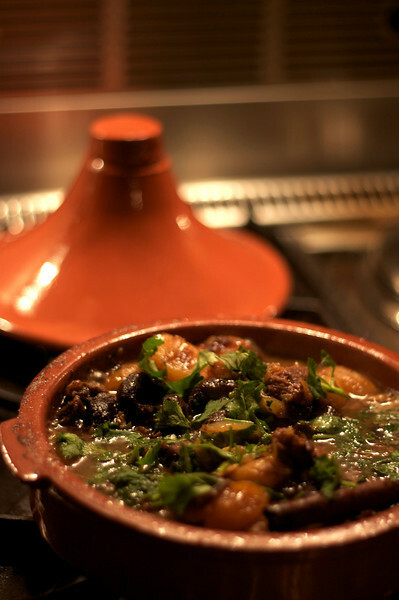 You can use an earthen tagine on a stovetop, but I recommend a few things. First, use a diffuser (you can find inexpensive ones at any kitchen store or online) which helps distribute the heat evenly. Second, use low and medium low heat settings only. Third, watch your timing. Don’t shut off the heat source and immediately remove the tagine (imagine what happens when you put ice cold water in a very hot glass). If you can, time it so that your recipe finishes cooking and sits to cool on the stovetop for as long as possible before taking it off; you can also place it on the table with the diffuser to help temper that change in temperature. And of course if your meal is informal enough, you can always just have people serve themselves from the stove (this means you can’t all sit around the tagine and eat from it communally, which is always nice, but it’s a compromise worth considering). 3. Can I just do without? Absolutely yes. The thing is, tagines were originally used for cooking over coals (which is how they still are used in many places in the Maghreb), and if you ask me, even the best clay tagine used with a modern gas stove and the freshest ingredients can’t replicate what it’s like to cook with coals. If you don’t have a tagine or don’t want to risk the one you have cracking, you can always just cook in a sturdy cast iron dish or a heavy pot (the heavier the better) with a lid. At the end of the day, absent those hot coals and fresh air, what really makes a tagine is the combination of ingredients stewed together at length; keeping the dish nearly completely covered and cooking on low heat for most of the cooking time are the key elements. And that doesn’t need a special or fancy piece of cookware to happen. See all my tagine recipes here.